Aussie road trippers seeking the ultimate driving holiday can’t go past the renowned Alaska Highway in Canada’s Yukon Territory. The term ‘scenic drive’ doesn’t begin to describe the rugged beauty along this wilderness route, with snow-covered mountains, spruce forests, ancient glaciers and abundant wildlife making this a driving paradise. As this iconic route winds through historic communities and soaring mountain ranges, you won’t want to miss the key photo opportunities along the way. Read on for five unmissable stop-offs on this unforgettable journey. 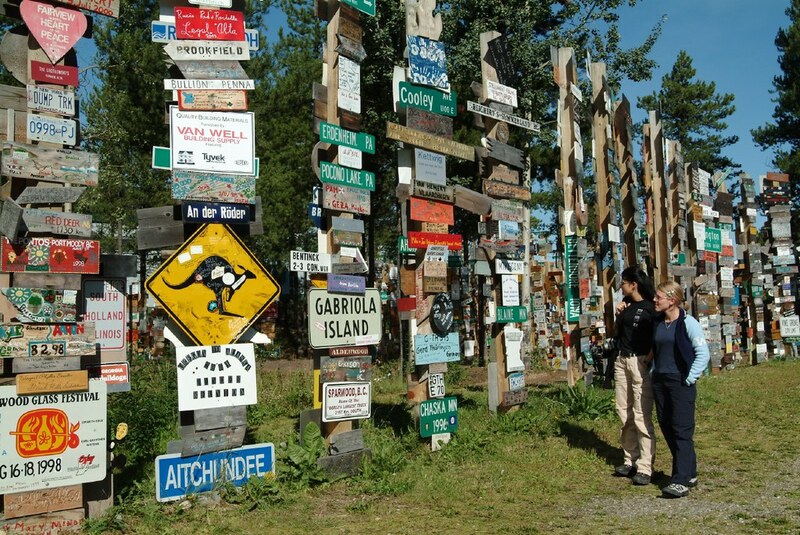 As you cruise through Watson Lake, east of Yukon’s capital city of Whitehorse, keep your eyes peeled for a road-side collection of more than 77,000 signs from around the world. This unique time capsule dates back to 1942 when US Soldier, Carl K. Lindley erected a sign marking the direction and distance to his hometown, Illinois. The trend caught on, with locals and visitors from across the globe continuing to add their own sign posts. You can BYO or make one at the Watson Lake Visitor Information Centre to contribute to this peculiar, colourful collection. If you’re travelling from late August to mid-April, you’re in the prime location to witness the mystical aurora borealis. During summer, head to the Northern Lights Centre, where you can experience the magic of the northern lights through some high-tech panoramic video and surround sound. Just 72 kilometres from Whitehorse, the historic town of Carcross is well worth a pit-stop. Check out some incredible First Nations’ artwork and stop for photos at the staggering totem poles towering overhead. A couple of kilometres outside the village, you’ll find the Carcross Desert, affectionately known as the world's smallest desert. 10,000 years ago, this was the bottom of a large glacial lake. Today, the sand dunes run to the shore of Bennett Lake, known for its beautiful beach covered in fine, white sand. Take a walk along the lake shores and discover the fascinating tales of Klondike gold stampeders who carved a treacherous trail on their way to Dawson City more than 120 years ago. It’s time to stretch your legs in the friendly town of Whitehorse. Stroll the Millennium Trail past the impressive Whitehorse dam and along the Yukon River to tour the regal S.S. Klondike sternwheeler, the last of its kind to operate on the river, now a National Historic Site. And don’t miss the Beringia Interpretive Centre, where you’ll meet the beasts that roamed Beringia before the last Ice Age, from mammoths and the giant short-faced bear, to the steppe bison, and the scimitar cat. Stop for lunch at one of the many funky cafés dotted along the main street, including Café Balzam, a creperie inspired by French cuisine based on locally produced fare. You’ll want to stay awake as you approach the friendly town of Haines Junction. We’re talking jaw-dropping panoramas of epic mountains that stretch beyond your windscreen to the horizon. Haines Junction, surrounded by the magnificent Saint Elias Mountains is the gateway to UNESCO site Kluane National Park and home to abundant wildlife, including the highest concentration of grizzly bears in North America. Check out the Da Kų Cultural Centre in the village and join a ‘campfire talk’ to learn more about the rich culture of the Champagne and Aishihik First Nations. Being half the size of Switzerland, Kluane National Park deserves more than a pit-stop to fully appreciate its splendour. Hundreds of hiking trails beckon, abundant lakes offer wonderful canoeing, and the Tatshenshini-Alsek river system, fed by ancient glaciers, is the ultimate white-water destination for thrill seekers. The four-hour drive to Canada’s most westerly community of Beaver Creek is peppered with unmissable stops. Watch the mesmerising Dall sheep through the telescopes at the Tachäl Dhäl Visitor Centre in the Slim’s River Valley as they graze on the mountainside. Better still, climb the park range to Soldier’s Summit for a closer look. Head on to Destruction Bay, a picturesque town that belies its name, with the glittering turquoise Kluane Lake and abundant wildlife. Cruise along the shores of the lake all the way to Burwash Landing where you can visit the Kluane Museum of Natural History, featuring no less than 70 species of Yukon wildlife and artefacts from the area’s Southern Tutchone people. A little further along, you’ll reach your final stop of Beaver Creek, on the Canada-US border, home to the White River First Nation for the past 10,000 years. The good news is your road trip doesn’t have to end here. Follow the Klondike/Kluane Loop drive over the Top of the world Highway to Dawson City and then back to Whitehorse. 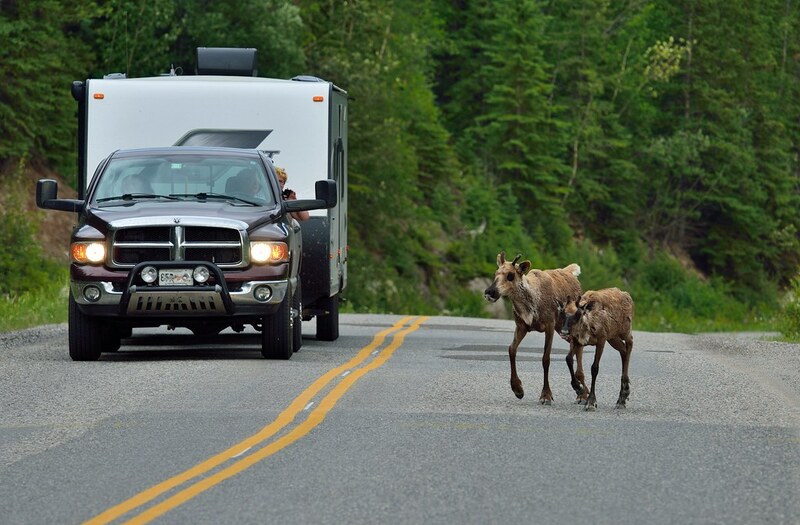 One thing is certain: your unforgettable Alaska Highway road trip will create stories you’ll be sharing for years to come. Air Canada has direct flights to Vancouver from Sydney, Brisbane and Melbourne, with connecting flights to Whitehorse and Dawson City available on Air Canada and Air North. For more information about Yukon visit www.travelyukon.com.